One year after the devastation of the earthquake, the men, women and children of Haiti are only starting to rebuild and recover. One organization making a difference is the Andrew Grene Foundation, named for a senior UN official who died in the disaster. The Prodigals’ Gregory Grene is the twin brother of Andrew, and he has spearheaded a star-studded Celtic benefit in his memory and honor. 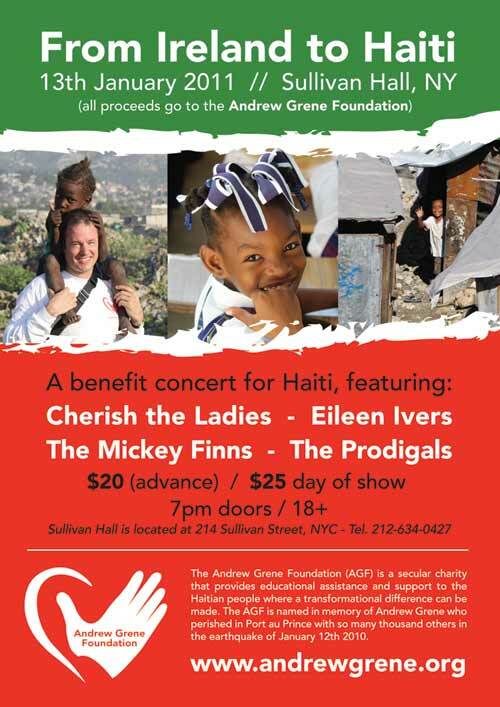 On Thursday January 13 at Sullivan Hall (214 Sullivan Street in New York), four standouts from the Celtic scene will join forces in a concert to benefit the foundation. They are Eileen Ivers, Cherish the Ladies, the Mickey Finns and, of course, The Prodigals. The Andrew Grene Foundation is funding schools and microfinance loans for small businesses in Haiti. In the field of education, the foundation’s target is scholarships for students to attend high school and college level education, which are out of reach for most children. A mere half of Haitian children have access even to primary education. Give your green for a worthwhile cause and get in return a great night of Emerald Isle sounds! The show starts at 8 p.m. with tickets available on www.ticketweb.com. Tickets $20 in advance, $25 on night of show.